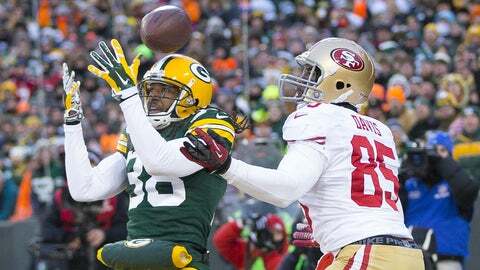 Packers cornerback Tramon Williams breaks up a pass intended for 49ers tight end Vernon Davis in the first quarter of Green Bay's wild-card playoff loss. GREEN BAY, Wis. — The youth movement has been going on for the Green Bay Packers since Ted Thompson took over as general manager nine years ago. Thompson’s draft-and-develop philosophy is well-documented, with some positives and some negatives along the way. However, with youth comes inexperience, and with inexperience comes a variety of issues. Many of those issues showed up during the 2013 season for the Packers. Now that Green Bay has gone through their eighth consecutive year ranking among the NFL’s six youngest teams, veteran cornerback Tramon Williams believes the Packers might need to find a more balanced approach to roster building. "Even though we always say it’s a young league, yeah, it’s a young league, but it’s an old league, too, because the old guys make the league go," Williams said Monday as he cleaned out his locker. "That’s the guys who’ve been there before, who know how to prepare, who mold the young guys. That’s what they’re there for." At age 30, Williams is the oldest player under contract with Green Bay for the 2014 season. The three players on the team older than him in 2013 (Seneca Wallace, John Kuhn and Ryan Pickett) are all free agents. And, with Williams set to earn $7.5 million next season, it’s possible that he could find himself a cap casualty, even coming off a very good season. "And I’m not that old," Williams said. "It’s just one of those deals to where you don’t want to . . . we keep being young around here, but you don’t want to disvalue the veteran players, because they actually mold the younger players. I was with (Charles) Woodson and those guys, and those guys molded me. I know what it takes." Last offseason, the Packers released Woodson, a future Hall of Famer, in order to save the team from having to pay him $9 million. Replacing Woodson in Green Bay’s secondary was rookie Micah Hyde, who’s 14 years younger. Williams was the oldest member of the Packers’ secondary in 2013, a group that featured Sam Shields (26), Davon House (24), Casey Hayward (24) and Hyde (23). "When you have a young team like this, that’s what you’re challenged with," Williams said. "You’re challenged with coming in and — with young guys, with talented young guys, they play but the game’s still fast for them because they don’t understand what teams are trying to do. They don’t understand the scheme fully. They don’t understand what the scheme can do for them once they understand it. That’s what you’re faced with. "Plus, the preparation. A lot of guys thought they know how to prepare when they were in college and whatnot, but then they get into the league and you find out that it’s a different level of preparation. That’s what you’re faced with with young guys. "I had the privilege to play with Woodson and (Nick) Collins and Al Harris. I understand what chemistry in the secondary can do. That’s what you try to find when you get a good group of guys. You want to get guys all on the same page. You want guys to see things like you see it if you’re the leader of that group. When you can get guys to that point, it slows the game down for everyone in that back end. That’s when you start seeing a lot of plays being made out there. Whether it’s your play or not, you know where the ball’s going and you go in and you make the play. That’s what we’re trying to get. "We have a great group of young guys in this room but they’re young. They can play, very talented but still, they’re young." Williams is no doubt hoping that Thompson doesn’t "disvalue" him this offseason. But after a season in which Green Bay finished with an overall record of 8-8-1 and was exposed in many ways, Williams might have a good point that it’s time for the Packers to be heavier on veteran presence. In coach Mike McCarthy’s post-game press conference following Green Bay’s playoff loss to the San Francisco 49ers, he repeated how "proud" he was of his young team. "We had some inexperience; guys had to play probably before they were ready and they stepped in there and they went for it," McCarthy said. Perhaps therein lies the problem. There were so many young players asked to step into big roles that it was unlikely for the Packers’ season to end with a trip to the Super Bowl. McCarthy was pleased with his team’s hard work, but veteran players may be the solution the franchise has been mostly avoiding during Thompson’s tenure.